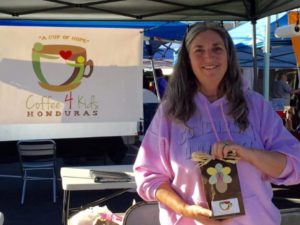 Shawn Plowman, the founder of Coffee4Kids, is part of the Peñasquitos Lutheran Church congregation. She first went to Honduras in 2016 and felt God call her to help people in Honduras. Shawn has since participated in three mission trips (March, July, September) to San Pedro Sula, Honduras since that calling. She brings a group down each mission trip that leads a week-long Vacation Bible School for hospitalized children and their parents at Mario Catarino Rivas Public Hospital. In addition, Coffee4Kids provides much-needed medicines, medical supplies and exams/treatments for these children. Shawn, who holds a master’s degree in Nutrition, has also started the first Feeding Center in Honduras to help children recover from malnutrition. Shawn organizes medical brigades in Rio Blanco, a very impoverished village, including rehydration talks, consequently saving the lives of 5-10 children in the village on each trip. Many people in the PLC congregation have been involved with this ministry by joining Shawn on a mission trip. sewing blankets to take to children in the hospital, knitting beanies to hand out to children and purchasing coffee to help raise funding for medications. Shawn has been most excited lately about taking many youth to Honduras to bring comfort and love to those most in need through Christ. Click here to visit the Coffee4Kids Honduras Facebook page to see many pictures of the hospital and children. Click here for the latest newsletter.